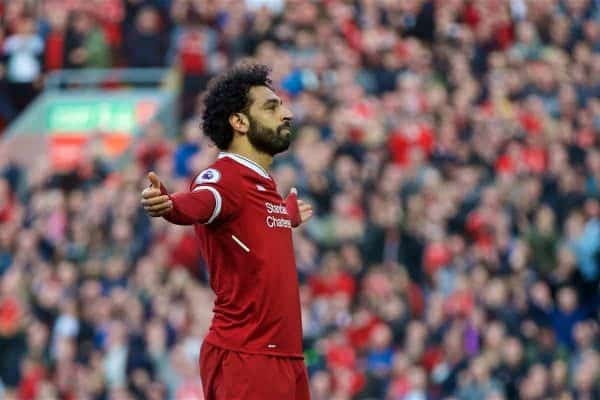 Mohamed Salah scored his 30th Premier League goal and his 40th of the campaign as Liverpool cruised to a 3-0 win over Bournemouth on Saturday. After the triumph of their 5-1 aggregate victory over Man City in the Champions League quarter-finals, the Reds returned to domestic duties on Saturday evening. Taking on Eddie Howe’s mid-table Bournemouth at Anfield safe in the knowledge that they were already seven points clear of fifth-placed Chelsea, this could have been set up as a less significant clash. Klopp stressed the importance of victory over the Cherries in the buildup, though, and with a week-and-a-half until the semi-final first leg against AS Roma he named a strong starting lineup. Salah, Sadio Mane and Roberto Firmino were all involved against a south-coast side who had conceded the joint-fifth most goals in the English top flight this season, with the odds stacked firmly against the visitors. The challenge was to keep up momentum during a hugely positive run, and fortunately they were able to stroll to another three points. Bournemouth began the game lined up in a bizarre 3-4-3 formation which suggested Howe had not done his homework, and Liverpool’s early pressure underlined this. 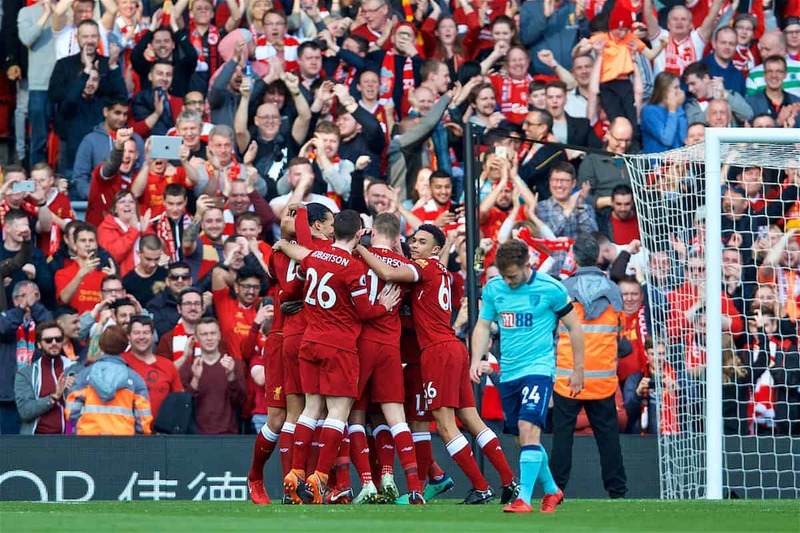 With the Reds stationed in the visitors’ final third throughout the opening stages, Mane made it count after his header was initially saved by Asmir Begovic, drilling home from close range. Continuing to dominate, Klopp’s side snapped into challenges and surged forward in droves, not allowing Bournemouth any opportunity to settle as the likes of Andrew Robertson and Alex Oxlade-Chamberlain impressed. Jordan Henderson, returning to the side after missing the midweek win through suspension, presided over the game with renewed vigour, as the Cherries struggled to gain a foothold. Mane continued to push for a second, almost laying a perfect lofted ball through for Salah, but Liverpool ended the first half just 1-0 up. After a bright start the Reds’ intensity dropped after the break, but the support of the Kop was unwavering, and they were almost rewarded as Virgil van Dijk struck just over from long range on 55 minutes. Salah, looking for his 40th goal in a historic campaign, snatched at a host of chances before he was brought down by Nathan Ake in the penalty area, but referee Chris Kavanagh waved away appeals. 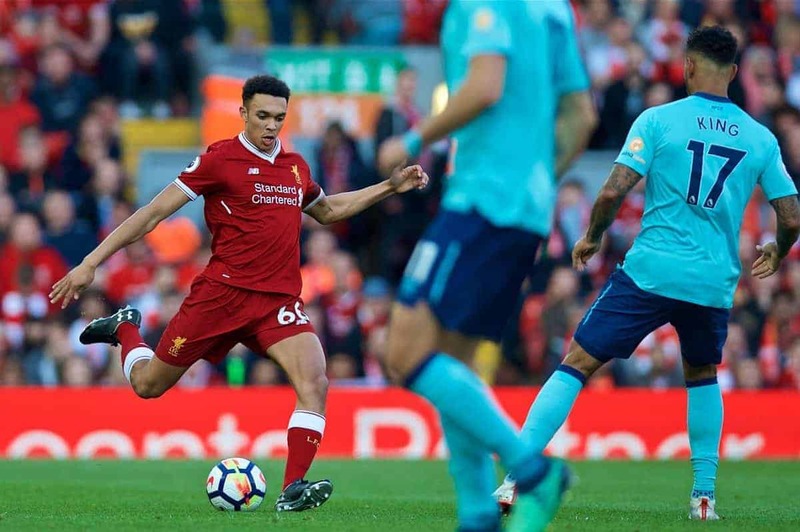 The Egyptian didn’t have to wait much longer for his strike, however, as he headed Trent Alexander-Arnold‘s phenomenal ball from the right over Begovic to make it 2-0. Klopp took this lead as an opportunity to withdraw Mane, introducing the evergreen James Milner in the opening goalscorer’s place as he looked to exert further control on proceedings. Bournemouth made a rare foray forward as Dejan Lovren struggled with an injury, but Dan Gosling’s hooked effort was denied by Loris Karius in one of the German’s only contributions to the game. With the final whistle approaching Firmino struck late to allow Anfield to celebrate another priceless three points, with Sunday bringing a day of reflection on the 29th anniversary of the Hillsborough disaster.